There is quite a bit happening in this image I captured today. The giant Great Lakes freighter Calumet, built in 1973, weighing in at over 10,000 tons and 630 feet long (192 meters), was entering the channel at Grand Haven, Michigan. The ship dwarfed the Lighthouse as a kite boarder in the foreground took in the view. The South Haven Lighthouse has a completely different and more dramatic look at night. I decided to take advantage of a mild evening tonight to capture the light and color it exhibits. The tall ship, Friends Good Will, sailed out of the channel in South Haven, Michigan today on its way to the big lake. The ship is a reproduction of the original sailing vessel which had its maiden voyage in 1811. I captured the moment this little one walked from a man to a woman, most likely its parents, on the north breakwater light in Ludington, Michigan’s Stern park as the sun was setting. This lighthouse was voted one of the top 10 lighthouses to see in the U.S. by the Weather Channel. I think this family moment added its own beauty to the scene. The Petite Pointe Au Sable Lighthouse (The Little Point of Sand Lighthouse) was completed in 1874 along the shores of Lake Michigan. Its light rises 108 feet over the waters to signal ships the location of the shoreline. I had photographed it recently during the day and decided to try the same subject at night with the sky full of stars this time. 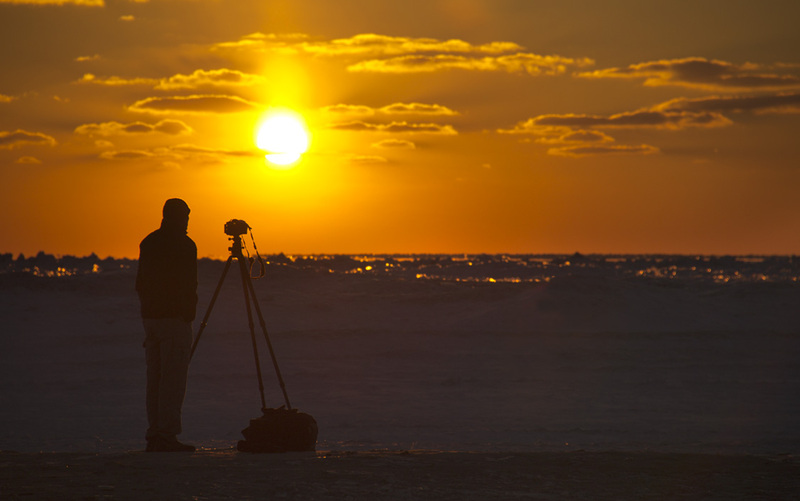 I found this lone photographer on the icy beach in South Haven near frozen Lake Michigan as the sun was beginning to set today. I also took advantage of the opportunity to capture the image below of the Lighthouse and pier that was close by. The lighthouse has been standing sentinel there since 1903. 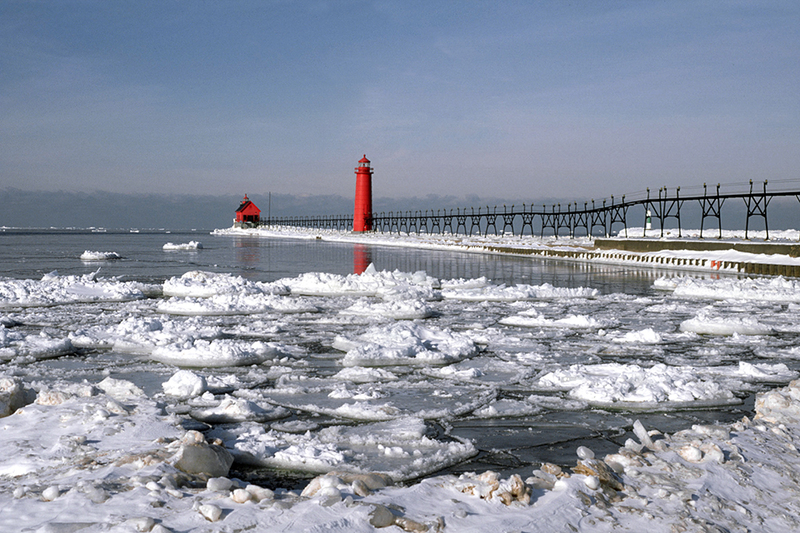 The pier and lighthouse on Lake Michigan at Grand Haven’s State Park often has ice flows in the winter. 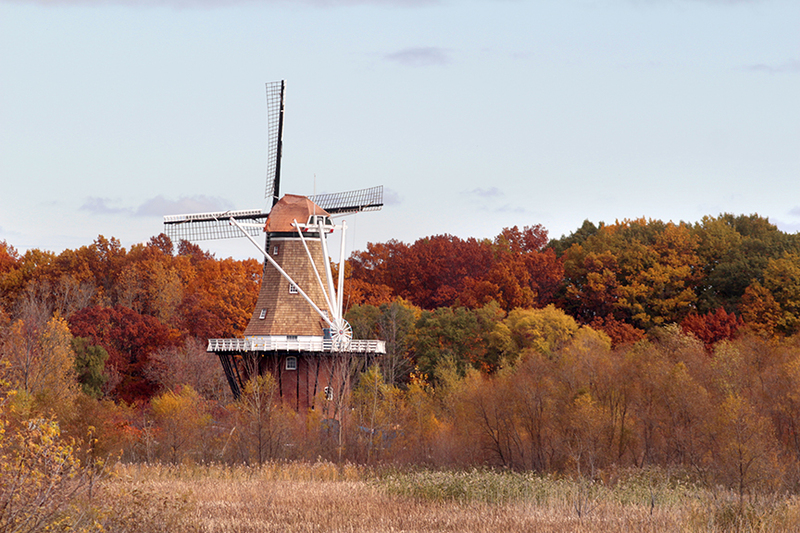 I enjoyed this view of the lighthouse on Windmill Island in Holland, Michigan with the surrounding Autumn colored trees. 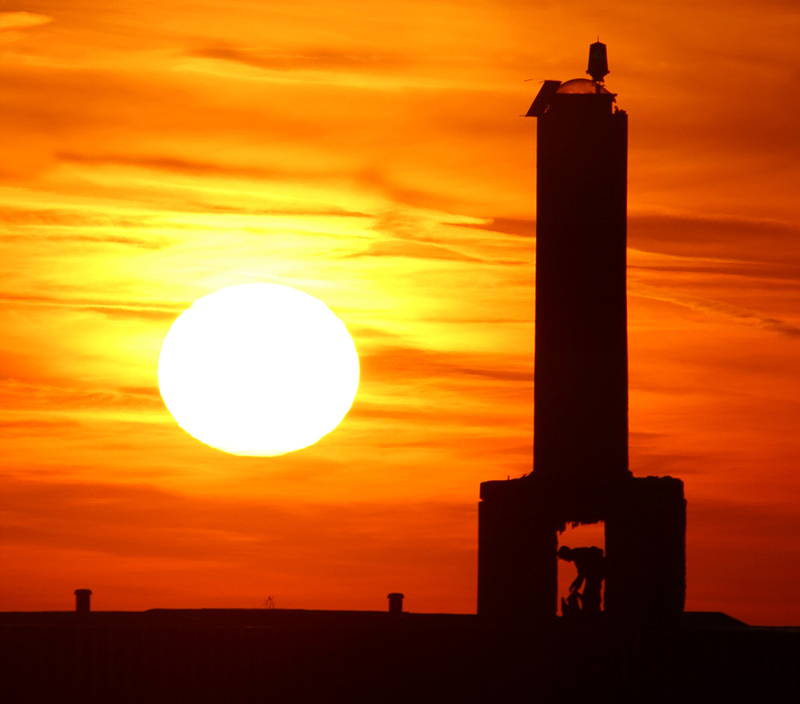 A lone photographer prepares his equipment under the shelter of a structure on the end of a pier in Holland, Michigan as the sun was low in the sky.